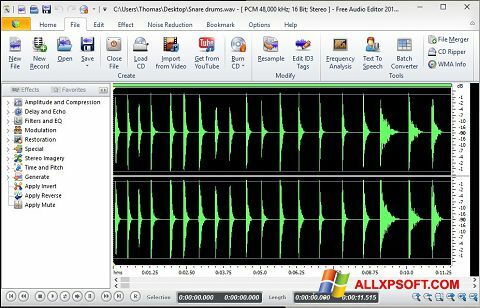 Free Audio Editor for Windows XP - a convenient multimedia application created to process audio files. Using its functions, users can edit any musical composition, cut out separate sections of the audio track and change the quality of the melodies. The utility is equipped with a simple interface that displays sound frequencies in the form of two multi-colored graphs and a time line. The program supports the connection of functional plugins that extend the standard set of tools. You can free download Free Audio Editor official latest version for Windows XP in English.